It is within the inductor that the varying magnetic field required for induction heating is developed, through the flow of alternating current. 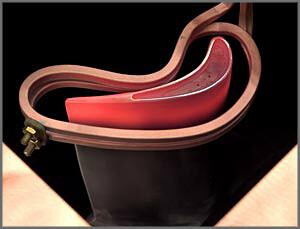 Inductor design is therefore one of the most important aspects of the overall induction heating machine. A well-designed inductor provides the proper heating pattern for your part and maximizes the efficiency of the induction heating power supply, while still allowing easy insertion and removal of the part. The inductor does not have to be shaped in a helix. With the right design, it is possible to heat conductive materials of any size and form, and also possible to heat only the portion of material required. It is even possible to heat different zones of the part at the same or different temperatures by means of a proper design of the inductor geometry. Temperature uniformity within your part is achieved through correct inductor design. The most effective uniformity can be achieved in round parts. Due to the nature of electrical current path flow, parts with sharp edges could preferentially heat in those areas if the proper inductor design is not used. There is a proportional relationship between the amount of current flow and distance between the inductor and part. Placing the part close to the inductor increases the flow of current and the amount of heat induced in the part. This relationship is referred to as the coupling efficiency of the inductor. Inductors are often made of copper tubing - a very good conductor of heat and electricity - with a diameter of 1/8" to 3/16"; larger copper coil assemblies are made for applications such as strip metal heating and pipe heating. Inductors are usually cooled by circulating water, and are most often custom-made to fit the shape and size of the part to be heated. So inductors can have single or multiple turns; have a helical, round or square shape; or be designed as internal (part inside inductor) or external (part adjacent to inductor). The GH Group has patented a revolutionary new system for inductor design and production using exclusive microfusion technology. With microfusion, identical inductors can be produced from the same manufacturing mold with exceptional consistency. Advantages of microfusion include improved durability and increased repeatability for large scale heating processes such as hardening automotive parts. Production rates can be increased with reduced maintenance and downtime - no recalibration is needed when inductors are changed out. Spare inductor inventory can be reduced. 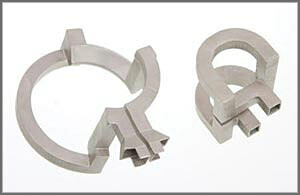 Inductors are designed to match the shape and size of the part being heated. The microfusion process produces a one-piece inductor without welds or braze joints.